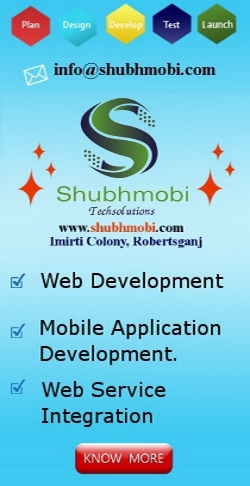 www.robertsganj.in is well managed by Shubhmobi Techsolutions, is a Software & Application Development (Website and Mobile) Company in Robertsganj, Sonbhadra, U.P India . We are a bunch of young guys, whose aim to deliver high-value mobile applications, wonderful Websites and secure software. We have a dedicated developer’s team who has more than 8+ years of expertise in IT Industries. We have proficient expertise in website designing and development. Our developers and designers are highly skilled professionals which work hard to achieve their goal in very short time. * Website Designing and Development. Thank you for your interest with us. Please provide the following information about your business needs to help us serve you better. Uttar Pradesh ( India ).